A deer infected with chronic wasting disease will look very thin and can start drooling. Infected deer also become tame and less afraid of people. 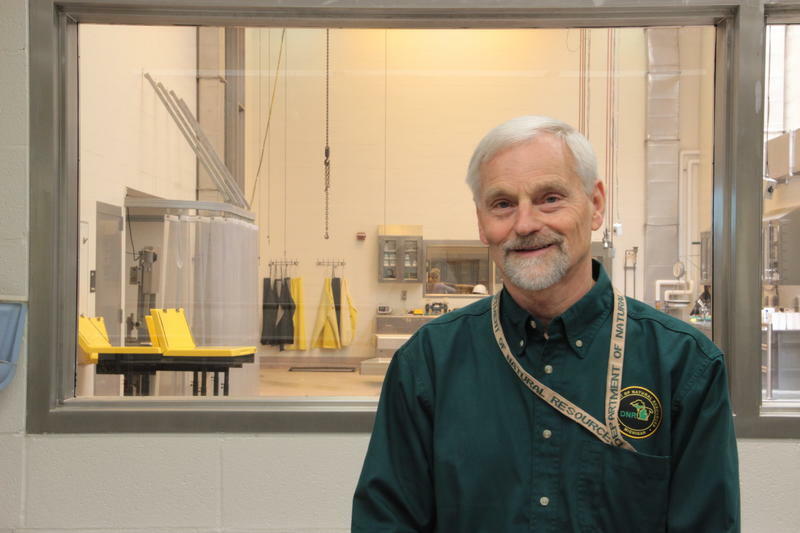 Dr. Steve Schmitt is the Michigan DNR's veterinarian-in-charge. 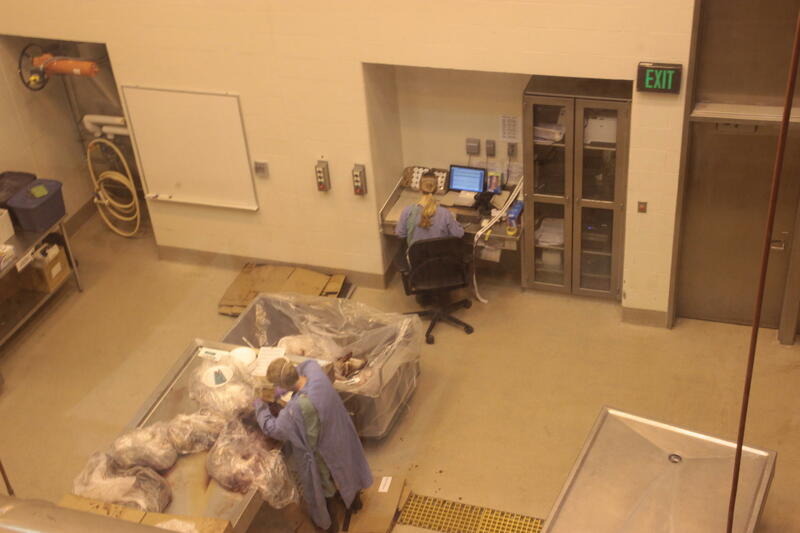 In this part of the Biosafety Level 3 lab, USDA veterinarians test sheep heads for a disease called scrapie. 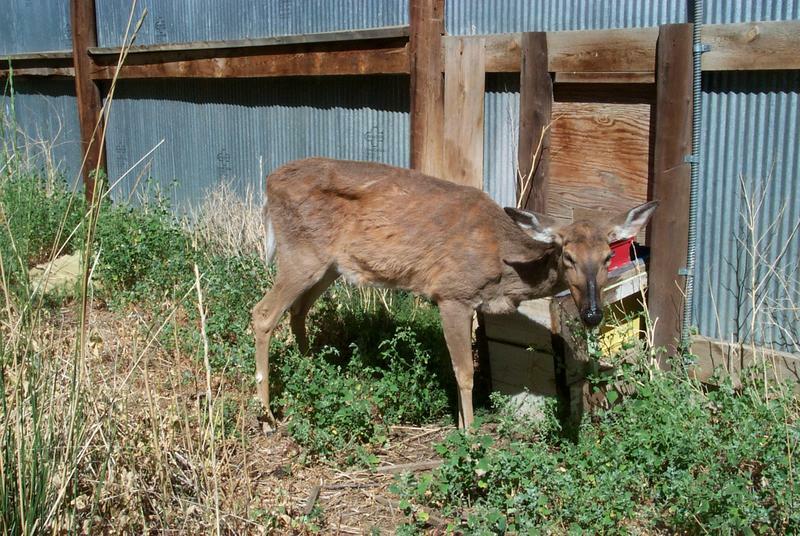 Chronic wasting disease was found in a captive deer in Kent County in 2008. This spring, a homeowner in Ingham County reported a sickly-looking deer wandering in their front yard, and that deer is the first free-ranging deer to test positive for CWD in Michigan. 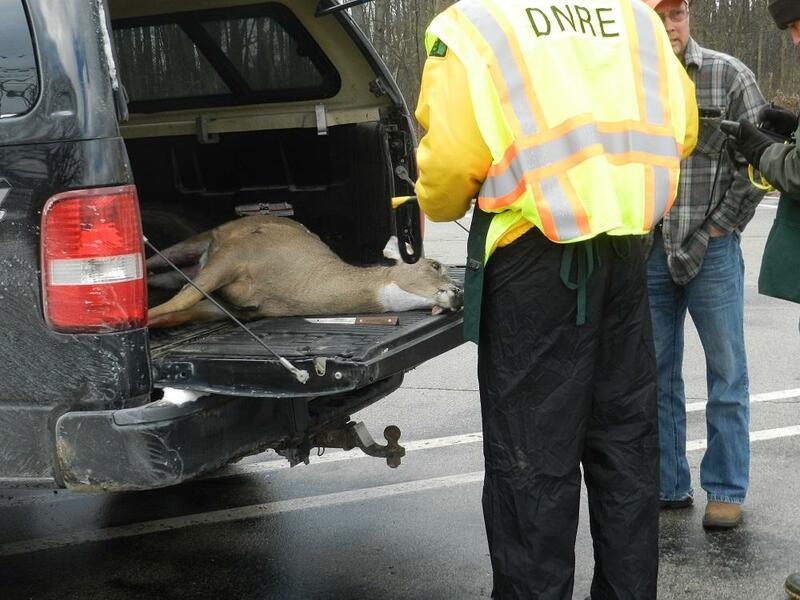 Now, the DNR wants to find out how many more wild deer could be sick, and whether this is an isolated incident or the beginning of a bigger outbreak. It’s contagious, it affects deer, moose and elk and it’s always fatal. “It creates microscopic holes in the brain resulting in severe neurologic disease and ultimately the death of the animal," says Dr. Steve Schmitt. He’s the veterinarian-in-charge with the Michigan Department of Natural Resources. If you see a deer that could be infected with chronic wasting disease, DNR officials want you to call them at 517-336-5030. We’re looking through a window into a high security area called a Biosafety Level 3 lab at MSU's Diagnostic Center for Population and Animal Health. “That’s where we do wear respirators. All air that comes in has to go out through HEPA filters. There’s where we do bovine tuberculosis, we do our chronic wasting disease work in there, and we can actually handle anthrax in there,” he says. Schmitt says they’re bringing in road-killed deer to this lab to test them. “It's been shown that road-killed animals are more likely to have CWD, and the reason for that: if you have these microscopic holes in your brain, this severe neurologic disease, you’re more likely to step out in front of a car,” says Schmitt. The discovery of chronic wasting disease in this free-ranging deer kick-started the state’s CWD plan. It means state officials will kill deer in a two-mile radius around where the wild deer tested positive. They’ll then test them. 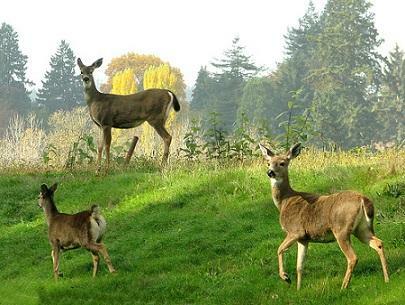 Mandatory checking of deer for the disease will be required in nine townships. The DNR will also require all hunters in nine townships in the core CWD area to have their deer tested, and Schmitt says any hunter outside that area who wants to have their deer tested can. 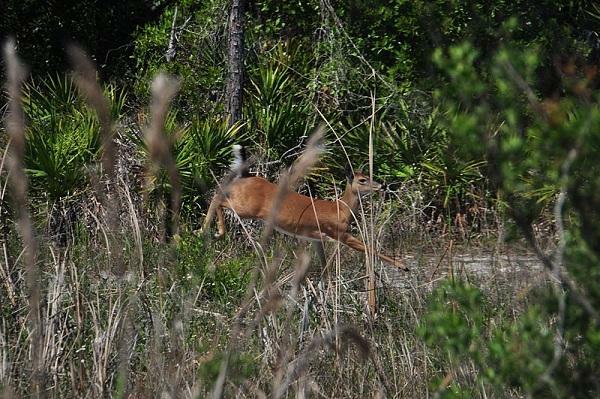 Officials say if a deer tests positive for CWD, you shouldn’t eat it. “To date, there’s no true evidence that CWD has crossed into humans and is therefore a human pathogen, but there’s always the possibility that disease could transmit into humans. The risk is very, very low but it certainly is not zero. So, most health organizations have recommended that if you’re hunting in an area where CWD is known to exist, that you have that deer tested for disease, and if it comes back positive, that you not consume it,” says Richards. Chronic wasting disease is a tough disease to manage. That’s partly because deer can be infected for several years before they show any symptoms. State officials say they’ve tested thousands of deer since 1998 and haven’t detected an outbreak yet. 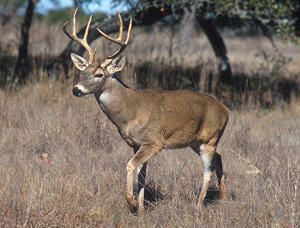 One of the ways the disease can spread is when deer gather. So the state’s CWD plan includes a ban on baiting and feeding of deer in Clinton, Shiawassee, and Ingham counties. “We’re certainly hearing some resistance to the baiting and feeding bans in those three counties,” says Amy Trotter, the deputy director of the Michigan United Conservation Clubs. She says they’re encouraging hunters to comply. If you see a strange-looking deer, DNR officials want you to let them know by calling 517-336-5030, or by submitting an online report. Deer with chronic wasting disease get very thin and can start drooling. They also become tame and less afraid of people. The Republican presidential contender is expected to outline a path away from the nation’s recently enacted health care reform law… Romney has been extremely critical of the health care law enacted last year, even though it’s very similar to the law he enacted as governor of Massachusetts. Romney’s speech will address his proposal to replace the law. Toyota announced yesterday that its fourth-quarter profit fell by 77%. 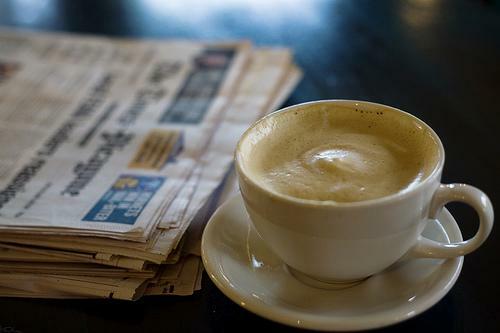 Reasons for the decline include the strong yen versus the dollar that eroded Toyota’s profits overseas and the fact that the automaker’s global production plummeted after March’s earthquake and tsunami. Meanwhile, the Associated Press reports that Toyota says, “its North American production will rise to 70 percent of normal in June as the company begins to recover from parts shortages caused by the earthquake in Japan"
The tax reform plan has been before a Senate committee this week, but there have been no votes on the measure. Republican Senators on the panel walked in and out of hearings, which may signal they weren’t ready for a vote. The tax plan is controversial. It would eliminate the Michigan Business Tax in favor of a profits-tax on some corporations, reduce the state Earned Income Tax Credit, and tax some future pensioners. Senate Majority Leader Randy Richardville says he still hopes the Senate will vote on the package this week.